Gathered by Marion E. Colthorpe, The Elizabethan Court Day by Day (ECDbD) is a record of the people, places, and events of the reign of Queen Elizabeth I. Colthorpe consulted state papers, diaries, government records, and other primary source documents to bring together details about what happened on each day of Elizabeth’s reign. The events of ECDbD depict the movers and shakers of Elizabethan England at play and at work. They attend plays, tournaments, and bear-baitings; go on progresses and attend house parties. They prepare for war, send gifts, and receive ambassadors. In its current format, the records are arranged by date and presented to readers in year-long chunks as PDFs. If you know the date an event occurred, you can skim through the document and find it, but we currently have no way to search the records or browse by topic, person, or place. At the Folger we think this dataset is going to be an amazing resource for researchers, but how do we make it easy to search? That’s where students, faculty, and other community volunteers come in. 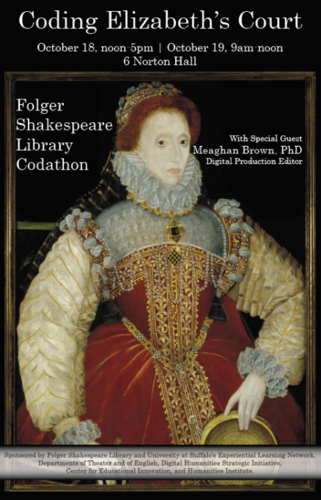 On October 18th and 19th, 2018, Meaghan Brown from the Folger Shakespeare Library and Danielle Rosvally and Nikolaus Wasmoen from the University of Buffalo teamed up to throw a code-a-thon at the University of Buffalo. Students and faculty were introduced to encoding text documents, eXtensible Markup Language (XML), and the challenges of humanities data. By marking up the texts in XML, we’re able to begin identifying important elements of each entry, such as people and places involved. After reading the entry, participants were asked to classify it according to a type and note where it took place. The highlight view for those less comfortable (or simply less familiar) with XML encoding. While the workshop participants were helping to identify data in this project, they were also helping to test out a new tool. 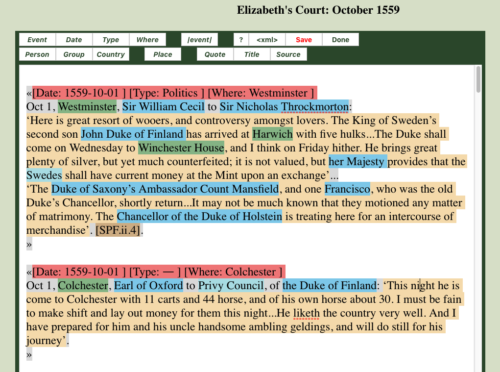 Mike Poston, the Folger’s programmer, created an interface that preloaded Colthorpe’s texts month by month and provided a graphic user interface for tagging the text. Based on Dromio, our transcription software, the new tool allows participants unfamiliar with encoding languages to dive into analyzing the events, while letting more advanced students toggle between a highlight view and an XML view. Participants were invited to drop in to the workshop on a rolling basis, and one class devoted an entire period to the project. We hosted several tutorials throughout the day which served as introductions to the data and the tool for encoding it. Some participants were well-versed in the time period. We had faculty and graduate students from Modern Language and English departments who targeted specific months because they knew the dates of events relevant to their research. The undergraduate students who participated came from a wide range of disciplines. Drama, English literature, history, modern languages, and computer science were all represented, although the vast majority had little background in early modern history and only a couple had any background in coding. Students were encouraged to supplement close-reading with resources like the Oxford Dictionary of National Biography, Google Maps, and Wikipedia. Instructors were on hand throughout the two-day workshop to answer questions, which ranged from “what’s an aglet?” to the relationship between the Earl and County of Essex. Essex the Earl or the county? Participants discovered that close reading was required at times to differentiate between a person and a place. We needed human readers in no small part because it’s difficult to tell the difference between “Essex” (Robert Devereux) and “Essex” 51.7343° N, 0.4691° E. Computers can’t tell the difference. Similarly, “England” sometimes referred to the country, and sometimes was used to stand in for the actions of the Government. “England declares war on Spain” doesn’t involve a place—it involves a corporate body. One student attempted to speed things up by using “Ctrl+F” to find all instances of England… and then realized he still needed to read the entry to figure out if he was marking the Queen of (a “person”), an action by the government (the “Country” tag), or a geographic reference (“place”). We found that students became engaged with the project and the events at court when history was brought to life through everyday details. In Dromio, the ECDbD is broken down into single months. Many students, otherwise picking at random, chose to encode their birth-months. They then got sucked in by the familiarity of some of the anecdotes and events they were encoding. About halfway through the code-a-thon, we started a running list of funny events that students uncovered in their work, such as the Queen skipping meetings, calling in sick to watch one of her favorites play tennis. We put the list in the front of the room, and encouraged students to read these anecdotes aloud as they found them. Part of the joy of coding together is that you can bond over these findings, and it makes the process much more engaging. Several students discussed continuing to code after the event, one because she was close to finishing her month (even though “Nothing happens in May of 1562”), and others because they found the process to be fun. This first code-a-thon was a success. About 62 participants contributed significant work to the project. Their feedback is helping us refine this new use of Dromio. We’ve identified some ways to make the tool and the process better. We look forward to running this experiment again with new groups and discovering the patterns that shaped life in Elizabeth’s world. Danielle Rosvally, Ph.D., is a clinical assistant professor of theatre at the University at Buffalo. Her research involves the intersection between nineteenth century American businessmen, economy, and William Shakespeare as an examination of theatrical business and American theatre performance. Her work has a heavy digital bent, using digital methodologies to examine and explore historical phenomena as well as examining digital media itself. She works as a digital project coordinator with the Folger Shakespeare Library. What a fascinating project, it makes me wish I had a parallel existence. Hello. This is a great project. Is there a way to add to the events listed? Sir John Baker published an article last year in the Law Quarterly Review which discusses a visit by Elizabeth I and Sir Christopher Hatton to Middle Temple on 3 March 1578 and that they attend a reading as an impromptu visit. The reference to Sir John’s article is: A Royal visit to the Temple in 1578, Law Quarterly Review, 2017, 133(Oct), 535-537. Hi Renae! The first phase of the project will concentrate on encoding what’s there, but then we do hope to create a means for folks to contribute missing events. We just want to hold off on that until we can have an interface that let us collect them in a standardized way, so we’re not expanding the scope of the processing before we’re done. As extensive as this resource is already, we know it’s not complete. We’ll definitely want to add this later!